In 1776 five students at the College of William and Mary founded Phi Beta Kappa as a society devoted to the pursuit of liberal education and intellectual fellowship. Today the PBK Society is the oldest and most respected undergraduate honors organization in the United States. If you are the proud holder of a PBK Key and you live in the D.C. area, the best way to keep in touch with your fellow Phi Betes is by joining our local PBK Alumni Association, one of more than 50 across the country. 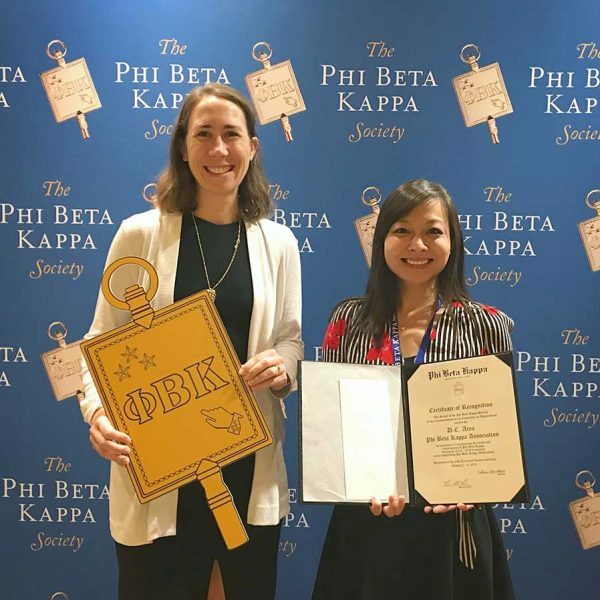 Our mission in the D.C. Area Phi Beta Kappa Association (DCPBK) is to uphold and promote the Society’s ideals of life-long learning and strong civic character. We do this by providing members an opportunity to participate in cultural and intellectual activities and networking opportunities. Each year we organize a range of talks, educational tours, and recreational events. We are often treated to special exchanges with eminent thinkers arranged just for us. DCPBK has a very active Young Professionals Program with happy hours and customized activities. We also have a popular Book Club and a Mentorship Program pairing experienced and younger members. In 2013 we held a banquet to celebrate our 100th anniversary, with Harriet Fulbright, the wife of the late Arkansas Senator and scholar, as our keynote speaker. Back in 1913 our founders met at the University Club to form a local Association of local PBK alumni. Their goal was to foster scholarship, friendship, cultural pursuits, and intellectual exchange among PBK members in the region. Since that time we have stayed true to our roots, while expanding our programming to meet more diverse interests. The national PBK Society honored DCPBK with an Outstanding Association Award at its 2018 Triennial Council Meeting. It was our second such award in ten years. We are proud to be recognized for our ability to meet the needs of our PBK alumni members through our varied agenda and interaction on social media. The Society has also recognized our commitment to the community through our longstanding High School Scholarship Program for college-bound local seniors, as well as our ongoing engagement with the PBK Chapters in area universities. Taken together, our portfolio sets a high standard for other PBK Alumni Associations nationwide. Are you ready to join DCPBK?